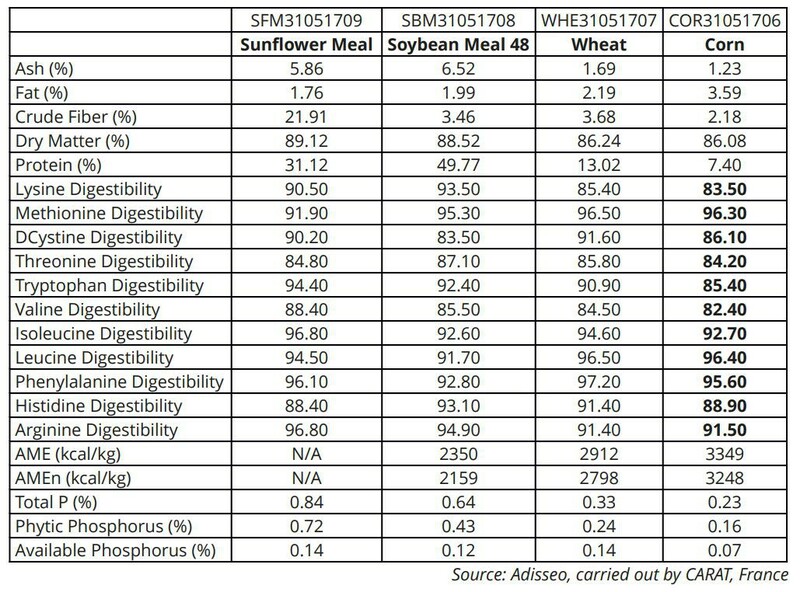 All cereals and protein meals contain high nutrient value. However, animals are unable to fully utilize them, due to the complex nature of feedstuffs as well as partially efficient digestive mechanisms. The digestibility is further affected when dietary composition includes alternative and new raw materials such as milling by-products, which contain higher levels of undigestible components. Therefore, understanding these raw materials, their precise nutrient availability and anti-nutrient content forms the basis of their optimum utilization without affecting productivity. NSP and phytate are antinutritional factors present in feed. They have direct and indirect effects on digestion, absorption and metabolism, which affects the digestibility and utilization of nutrients. To which extent is digestibility affected by these compounds? What are the methods to evaluate their impact on global digestibility? NSP have a direct negative effect on feed digestibility, due to their complex structure that makes them difficult to degrade for animals. They also can have an indirect effect on the global digestibility because the cell wall structure in some plant materials may encapsulate potentially digestible nutrients (source: Prof. Bach Knudsen’s presentation during PSA 2018 scientific symposium). All cereals are rich in NSP and anti-nutritive factors, higher in Arabinoxylans and cellulose especially in corn, wheat and rice, while barley and oats have predominantly β-glucans. Level of NSP and other antinutrients are up to 3 times higher in cereal and protein meal by-products, which therefore has the potential of reducing digestibility and performance of the animals. The soluble NSP absorb water in the intestine and form viscous digesta. As a result, it reduces the contact between the feed and digestive enzymes and slows the uptake in the gut of released sugars, amino acids and lipids. 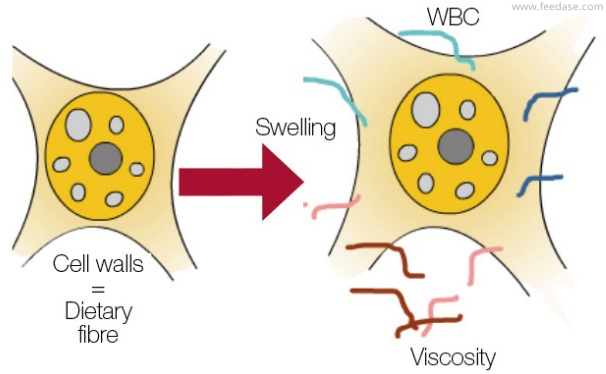 Nutrients are encaged inside complex fibre structures. 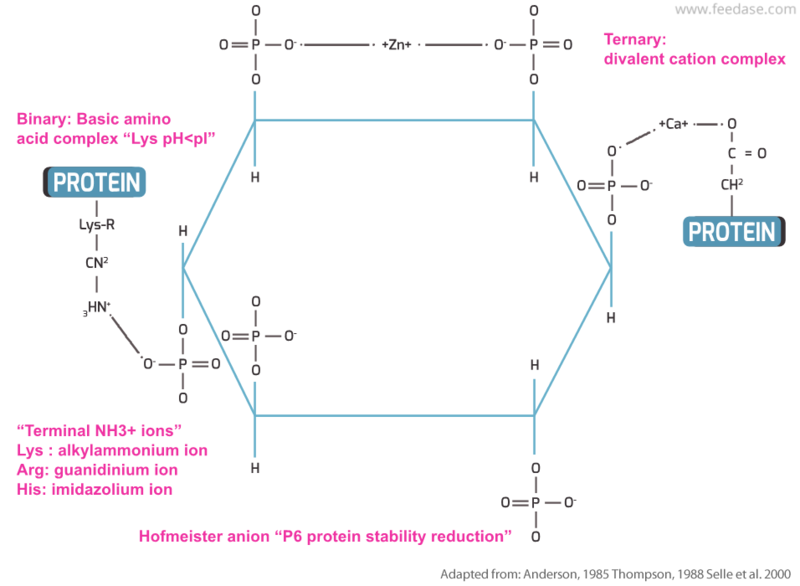 The endogenous enzymes cannot break through the fibrous layers to release nutrients. This prevents/ reduces nutrient-enzyme contact, as a result, animals are unable to utilize these nutrients. And thus, the valuable nutrients get excreted through feces, undigested. 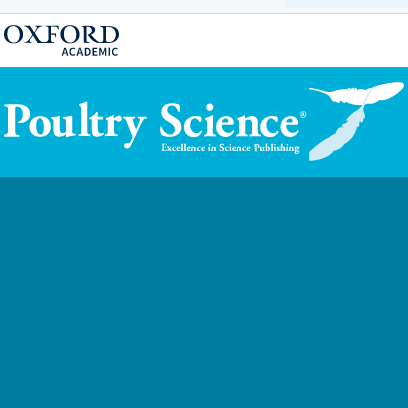 Cozannet et al., 2017 (Poultry Science, Volume 96, Issue 8, 1 August 2017, Pages 2743–2750) showed that the compositions in NSP and AX depends on the ingredient composition and density of the diets (Table 1). 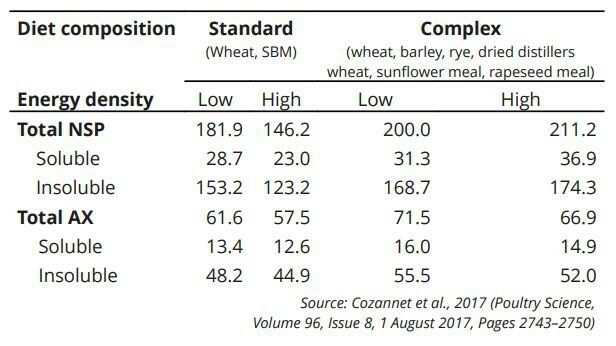 On average, complex diets (including wheat, barley, rye, dried distiller’s wheat, sunflower meal, rapeseed meal) contained 25% more NSP and 16% more AX than the standard diets (wheat, soybean meal). Regardless of feed composition, the total AX content represented 35% of the total NSP content. The digestibility of the organic matter was the lowest for the complex diets, demonstrating a negative impact of NSP on nutrient availability. The addition of a complex of multi-carbohydrase in feeds allow AMEn improvement from 1 to 9% in 3-week-old broilers depending on the substrate amount. The highest improvements where observed in diets having the highest level of NSP and low density. Being negatively charged, Phytic acid has strong affinity with positively charged molecules, chelating divalent or trivalent cations to form insoluble salts (Phytates). Phytate can bind starch, protein and fat, forming mineral/phytate/ nutrient complex in the anterior part of the digestion and make it less accessible from endogenous enzymes. An inhibitory effect of phytate on the activity of other endogenous proteolytic enzymes (trypsin, amylase, pepsin) has been reported, reducing protein digestibility. More and more NIR (near infra-red) analysis of raw materials is being used to estimate the presence of both nutrients and anti-nutrients. An example is given of the levels of individual amino acids digestibility, metabolizable energy for poultry, crude fibre and phytic phosphorus found in common raw materials (Table 2). Therefore, additional measurement more specific are required.